Hi Blogger, Welcome to Bloggershangout !!! In this Blogger Tutorial, we will look at deleting Static Pages in Blogger Blog. 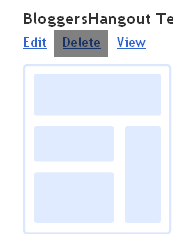 Step 2: Choose the blog for which you want to delete the Static Pages from the Blogger dashboard. and then click Edit Pages. Step 4: Select the Static Page and then click Delete link as shown below. and then you will be taken to a page which looks as shown below. That's it! You successfully completed deleting Static Pages in Blogger. If you have any doubt about "How to Delete Static Pages in Blog", please don't hesitate to comment.